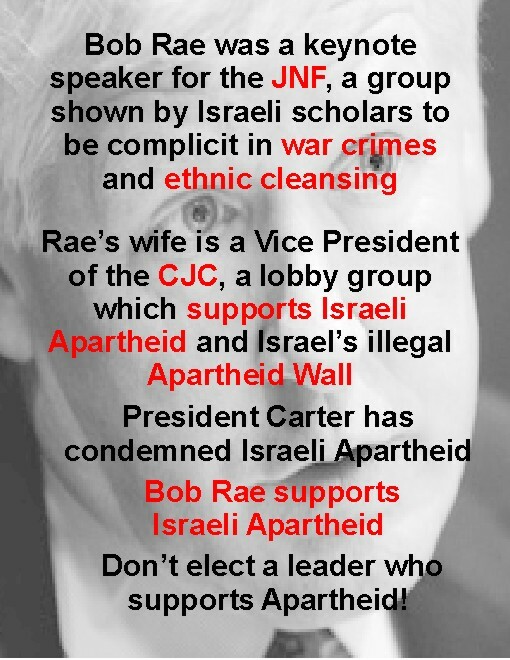 Bob Rae was the target of anti-Semitic attacks during the Liberal leadership contest, motivated at least in part by the fact that his wife is Jewish. Perly Rae stonily informed the delegate that she was the wife in question. The delegate beat a hasty retreat. The incident might have been shrugged off if it had been an isolated event. But Rae team insiders contend it was part of a larger pattern of anti-Semitic smears on Rae, who finished third. Bryden, who provided some of the best behind-the-scenes coverage of the Liberal leadership convention (see this article for just one reason why), also goes on to describe a flyer that was circulated electronically among some delegates slamming Rae and his wife for their defense of Israel. The hateful comments made against Liberal leadership candidate Bob Rae and his wife Arlene Perly Rae at the Liberal leadership convention in Montreal are reprehensible and will not be tolerated within the Liberal Party of Canada. Canada is a nation founded on diversity and tolerance for people of all faiths and ethnic backgrounds. The Liberal Party of Canada celebrates and promotes this diversity and tolerance. There is no room for abhorrent comments such as these within our Party. The individuals who made these despicable and prejudiced comments are condemned by myself and Liberals throughout Canada.